I did it. This past Sunday, after 7 months of training, I ran my first Marathon (26.2 miles). It’s a race and there is a winner, but the greater majority of the 6,200 people who ran this Marathon with me had no hopes of actually winning it… but rather they were in it to finish or do their personal best. It’s a lot like article writing and marketing because it’s a “process” and the true benefits go to those who take a longer term viewpoint rather than only wanting and expecting an immediate return. If I had to compare completing a marathon to article writing, I’d say that running it is as difficult as writing your first 262 articles… but the lessons you discover along the way about yourself, your niche, your life, your business and the improvement in your writing skills are something that no one can ever take from you. You become stronger for having made the investment of time & energy. I’m aware that many EzineArticles members have gone on long “article writing marathons” of their own… some who do it individually and others that band together to share the adventure. The marathon started out at 41 degrees F’ (6 degrees C’) with 12-15 mph winds. I was able to run pretty strong for the first 18.5 miles but became frustrated with various knee pains that forced me to run/walk and then by mile 25, a slow forced walk is all I could do. Now that I’ve experienced a marathon, I’ve learned that I have a body made for sprinting and I intend to leverage that by training for half-marathons (13.1 miles) with a focus on improving my speed rather than to just complete it. The biggest physical bonus I received from training for the marathon is a 11 lb drop in weight and 2-3 inches less around the waist… not to mention my 10k race pace is now 12 minutes faster than ever before. How many times did you feel like giving up during training? You probably ran over a thousand miles in the last two years to get ready for that 26.2 miles. What did you learn during training compared to what you learned during The Event? I learned that running 9-16 miles per week during training was NOT ENOUGH to prepare my body for the physical foundation needed to run a full marathon without stopping. If I had to do it again and someone told me that you have to run 25-35 miles per week at the peak of training to prepare for it, I might have passed on it all together as that’s a serious time commitment for a guy (me) who is not a runner by nature. I never gave up during training. In fact, I liked the training more than the event… and I knew that I had already won (on my terms) before the race even started. Congrats! I’m sure your feet became lighter the moment you crossed the finishing line. My hat is off to you for the execution of this running milestone. The best I have done for a marathon is thinking about it. Thanks for sharing your adventure. Great Job, I am smiling at your Strength of Character, you are a great Team Leader and you Run/Walk the Talk. Excellent. Congrats!!!! That’s really terrific. There is nothing like undergoing physical challenges to really see the potential that is within all of us. You may want to look into the Rock ‘n Roll marathon here in San Diego. You might not make it this year, but it’s really fun. We have bands playing at every station and a big concert that night. Keep training and look into cross training in order to keep your body strong. I suspected that you’d confirm that most progress is made during the daily training. Your sharing encourages me on many fronts. I used to be a marathon runner, along time ago when I was much younger and before I had kids, and I know how much time and energy it takes. Kudos to you for doing it with a family and a business. I’m sure finding the time to train required a lot of discipline. The cool thing is, is that now you are part of a very elite club. You’ve done something most people will never do. And that’s got to make you feel pretty special. Plus, now that you’ve done it, it’s pretty easy to see that you can do ANYTHING if you set your mind to it! I’m volunteering on one of the med teams this year for it. Good for you Chris! I just started walking back and forth to the San Diego Zoo. It’s 3 miles each way and some of it is uphill. It’s exhausting but the more I do it, the easier it gets! 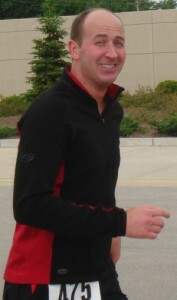 I started running 3 years ago, dropping 70 lbs, and ended up training for the NY Marathon in Nov 2007. Since I never ran in my life, finishing the marathon was one of my greastest accomplishments. I truly believe that like Debbie stated above, ANYTHING can be accomplished if you put your mind to it. It was the greatest experience and would recommend it to anyone. I would have loved to come to San Diego, but the event is coming up too soon and I didn’t want to sign up for any more marathons until I experienced my first. 4 days after, still sore… and probably won’t run until mid next week. Congratulations! It is an accomplishment and a unique high. I also discovered the bragging rights alone are worth the ordeal. My own marathon mission started at age 50 when I panicked and needed to prove I really wasn’t that old. Six weeks later I finished my first one – apparently I’m built for endurance, but not for speed. I finished my ninth at age 60 and decided that was enough. I never did get any faster and the long grind was becoming less appealing. Not to mention the 3 – 4 hours on the road every weekend. I get the warm and fuzzies hearing about all these people working out! Chris, you may want to integrate some yoga into your training which will help with soreness and could possibly help you to prevent injuries. That is awesome Chris! Congratulations! “Congratulations” seems like such a pale remark when considering what you just accomplished.